Annabella (Suzanne Charpentier) (1907 or 1909-1996), Film actress. Sitter in 2 portraits. John Armstrong (1893-1973), Painter and soldier. Sitter in 4 portraits. Sir Michael Elias Balcon (1896-1977), Film producer. Sitter in 33 portraits. Leslie Banks (1890-1952), Actor, director and producer. Sitter in 7 portraits. Monty Banks (Mario Bianchi) (1897-1950), Film director and dancer; husband of Dame Gracie Fields. Sitter in 4 portraits. Gertrude Maude ('Binnie') Barnes (1903-1998), Film actress. Sitter in 1 portrait. Edna Best (1900-1974), Actress. Sitter in 10 portraits. Lajos Biro (1880-1948), Novelist, playwright and screenwriter. Sitter in 1 portrait. Basil Bleck (1903-1971), Film producer. Sitter in 1 portrait. C.H. Brand (active 1937), Associated with the film industry. Sitter in 1 portrait. Clive Brook (1887-1974), Actor. Sitter in 14 portraits. (William) Nigel Ernle Bruce (1895-1953), Actor. Sitter in 2 portraits. Adrian Brunel (1892-1958), Film director. Sitter in 1 portrait. Geoffrey Carter (active 1937), Journalist. Sitter in 1 portrait. (Frederick William) Connery Chappell (1908-1984), Editor and writer. Sitter in 10 portraits. Ruth Chatterton (1893-1961), Actress. Sitter in 4 portraits. Hugh Ryan ('Jack') Conway (1887-1952), Film director. Sitter in 1 portrait. Ian Cotter (active 1937), Journalist. Sitter in 1 portrait. David Cuninghame (active 1937), Associated with the film industry. Sitter in 1 portrait. Basil Herbert Dean (1888-1978), Theatrical producer. Sitter in 18 portraits. Tamara Desai (active 1937), Actress. Sitter in 1 portrait. Marlene Dietrich (1901-1992), Actress. Sitter in 12 portraits. Robert Donat (1905-1958), Actor. Sitter in 5 portraits. Mr Dore (active 1937), Maitre d'hotel at Denham Studios Restaurant. Sitter in 1 portrait. James Francis ('Jimmy') Durante (1893-1980), Entertainer. Sitter in 1 portrait. Patricia Ellis (1916-1970), Actress. Sitter in 1 portrait. Jacques Feyder (1885-1948), Screenwriter and film director. Sitter in 1 portrait. Dame Gracie Fields (1898-1979), Actress and singer. Sitter in 27 portraits. Robert Joseph Flaherty (1884-1951), American film director and writer. Sitter in 17 portraits. Thornton Freeland (1898-1987), Actor and film director. Sitter in 1 portrait. Joan Gardner (1914-1999), Actress. Sitter in 1 portrait. Harry George (active 1937), Associated with the film industry. Sitter in 1 portrait. Ben Goetz (1891-1979), Film producer. Sitter in 1 portrait. Richard Haestier (active 1932-1937), Journalist. Sitter in 1 portrait. (Arthur) Jympson Harman (1891-1988), Film critic. Sitter in 1 portrait. Sir Reginald Carey ('Rex') Harrison (1908-1990), Actor. Sitter in 10 portraits. Valerie Babette Louise Hobson (1917-1998), Film and stage actress; wife of John Profumo. Sitter in 27 portraits. Paul Holt (active 1937-1941), Journalist. Sitter in 1 portrait. Miriam Hopkins (1902-1972), Actress. Sitter in 1 portrait. Leslie Howard (1893-1943), Actor. Sitter in 12 portraits. William K. Howard (1899-1954), Film director. Sitter in 1 portrait. James Wong Howe (1899-1976), Cinematographer. Sitter in 1 portrait. Jack Hulbert (1892-1978), Actor. Sitter in 2 portraits. Harold Huth (1892-1967), Film actor, director and producer. Sitter in 1 portrait. Robert T. Kane (active 1937-1949), Film producer. Sitter in 1 portrait. Vincent Korda (1897-1979), Film art director. Sitter in 13 portraits. Zoltan Korda (1895-1961), Screenwriter, film producer and director. Sitter in 1 portrait. Caroline Alice LeJeune (Mrs Edward Roffe Thompson) (1877-1973), Film critic. Sitter in 2 portraits. Roger Livesey (1906-1976), Actor. Sitter in 1 portrait. Edmund Lowe (1890-1971), Actor. Sitter in 1 portrait. Victor Andrew de Bier McLaglen (1883-1959), Boxer and actor. Sitter in 3 portraits. Ned Mann (active 1920s-1950s), Film special effects man. Sitter in 1 portrait. Patrick L. Mannock (1887-1969), Script writer and film critic. Sitter in 9 portraits. Raymond Massey (1896-1983), Actor and director. Sitter in 14 portraits. John Myers (active 1937), Writer. Sitter in 1 portrait. Dame Anna Neagle (1904-1986), Actress and film producer. Sitter in 41 portraits. David Niven (1910-1983), Actor, producer and writer. Sitter in 14 portraits. Maureen O'Sullivan (1911-1998), Film actress. Sitter in 5 portraits. Ignace Jan Paderewski (1860-1941), Pianist, composer, diplomat and politician. Sitter in 14 portraits. Steven Pallos (1902-active 1971), Film producer. Sitter in 1 portrait. Georges Périnal (1897-1965), Film cameraman. Sitter in 7 portraits. Erich Pommer (1889-1966), Film producer. Sitter in 8 portraits. Arnold Pressburger (1885-1951), Film producer. Sitter in 1 portrait. Walter Reisch (1903-1983), Screenwriter and director. Sitter in 1 portrait. Sir Ralph David Richardson (1902-1983), Actor. Sitter in 40 portraits. Edward G. Robinson (1893-1973), Actor. Sitter in 1 portrait. Dame Flora Robson (1902-1984), Actress. Sitter in 47 portraits. Harold ('Hal') Rosson (1895-1988), Cinematographer. Sitter in 1 portrait. Sabu Dastagir (1924-1963), Actor. Sitter in 9 portraits. Victor Saville (1897-1979), Film director and producer. Sitter in 6 portraits. Margaretta Scott (1912-2005), Actress. Sitter in 3 portraits. Morton Selten (1860-1940), Actor. Sitter in 1 portrait. Murray Silverstone (1895-1969), Film distribution executive. Sitter in 7 portraits. Josef von Sternberg (1894-1969), Film director. Sitter in 1 portrait. Harry Stradling (1901-1970), Cinematographer. Sitter in 1 portrait. John Sutro (1903-1987), Film producer. Sitter in 1 portrait. Robert Taylor (1911-1969), Film actor. Sitter in 4 portraits. Dorothy Annie ('Ann') Todd (1909-1993), Actress and producer. Sitter in 37 portraits. Conrad Veidt (1893-1943), German actor. Sitter in 8 portraits. Anton Walbrook (Adolf Wohlbruck) (1900-1967), Actor. Sitter in 8 portraits. Tom Kirby Walls (1883-1949), Actor and theatre manager. Sitter in 4 portraits. Tim Whelan (1893-1957), Film director. Sitter in 1 portrait. Herbert Wilcox (1892-1977), Film director. Sitter in 8 portraits. Arthur Wimperis (1874-1953), Composer and screenwriter. Sitter in 1 portrait. 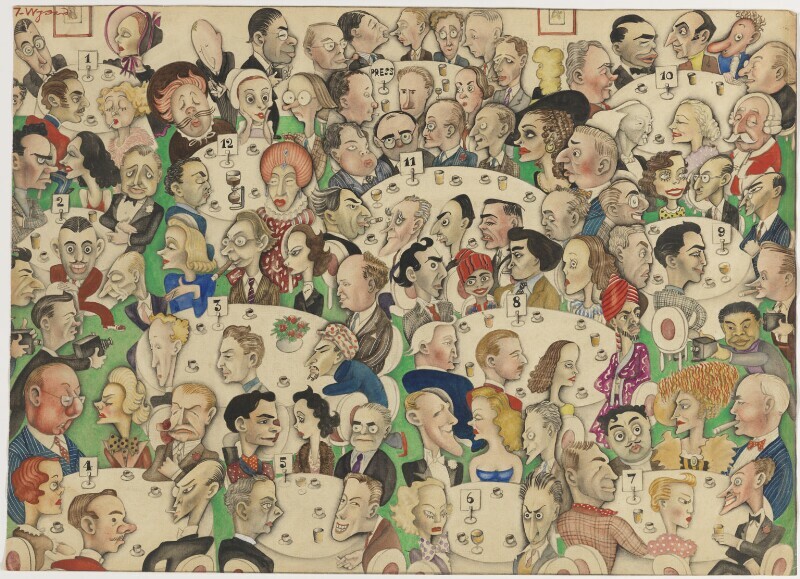 Anthony Wysard (1907-1984), Caricaturist. Sitter associated with 2 portraits, Artist associated with 58 portraits.